Asymptote Architecture principals Hani Rashid and Lise Anne Couture are pleased to announce the launch of the Velo Towers, within the Dreamhub development in the Yongsan District. Asymptote’s building is designed as an integral part of the master plan accommodating several new projects that are situated along the newly planned Yongsan Park. This page contains a selection of major South Korean office building designs, with links to individual project pages. We’ve selected what we feel are the key Korea Buildings, the Far East, but additions are always welcome. With its stark linear facade patterns, the Namdaemun Office Building in Seoul stands out from the vibrant market district that surround it. 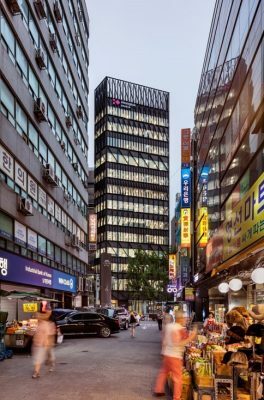 The office tower is Mecanoo’s first completed project in South Korea’s capital. 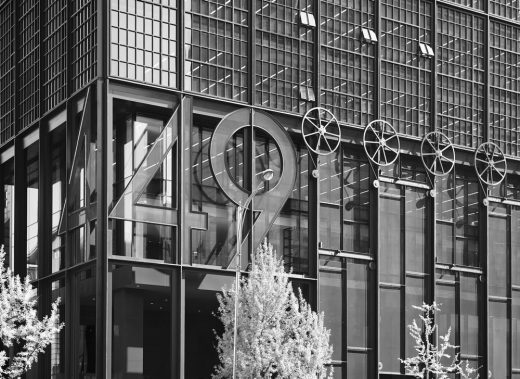 In designing a new fifteen-story headquarters for international luxury clothier Shinsegae International, Olson Kundig sought to create an iconic landmark in the heart of Gangnam-gu, one of Seoul’s largest districts. Completed in 2015, the building unites more than five hundred Shinsegae employees, who were previously spread between several buildings throughout the city. A case study in efficiency, SOM’s design of the 343-meter (1,125-foot) tall Diagonal Tower successfully integrates massing, structure, and performance to minimize wind loads, reduce construction costs, provide dramatic views, and meet strict energy codes—all while maintaining an iconic skyline presence. This Korean Skyscraper Building is part of the new Yongsan International Business district (YIBD) development in Seoul, is an iconic, 21st century sustainable office tower that is 46 floors. The design for the tower is inspired by YunDeung, traditional Korean paper lanterns. The concept is to create a tower as a faceted lantern, whose multiple planes reflect the sky and the earth and capture the light on its differing angles, creating a glowing gateway and beacon in the YIBD site.